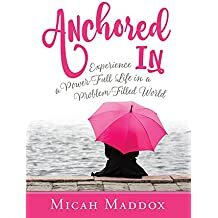 I want to share with you a new book that my friend, Micah Maddox has written. It’s called Anchored In and you can order it here. Micah shares personal stories, such as her father’s abandonment of her family, and couples them with biblical application to offer real-life glimpses of God at work. She offers inspiration to live a life full of God’s power rather than one that causes us to turn away and be paralyzed by problems. Hearing from God is not reserved for a chosen few, but rather promised to those who believe. If you are longing to experience God’s power in a deeper way, this is a journey for you. I met Micah at the Proverbs 31 She Speaks conference in July and instantly connected with her. Her heart for the Lord is so genuine and I know you will fall in love with her sweet spirit as well. Ladies and Gentlemen, I introduce to you my new, sweet friend, Micah Maddox. This entry was posted on August 30, 2017 with tags: #anchoredin, #micahmaddox by Deanna Young.